Our buildings are ideal for Ants because they provide shelter, food, warmth and water. You may see them in roof voids and subfloors, in your kitchen, along the edge of the building and in and around pet bowls. Ants leave unsightly ant trails and mounds and in some cases have even caused cracks in footpaths due to their excavations. They have been known to spread diseases by scavenging for food in garbage areas, animal faeces and other unhygienic areas. 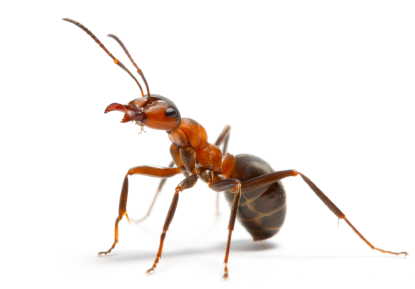 Some species of Ants bite and sting, such as Fire Ants whose stings can cause you a great deal of discomfort. Controlling Ants with a Guaranteed Program and advising our clients on how to reduce future problems. Inspect – carry out a survey and report our findings. Bait – apply special bait which is licensed and formulated for Ant control – (very safe for children and pets, in addition we also apply baits in reach places for your peace of mind). Dust – apply dust to roof voids, sub-floors and wall cavities. Surface Spray – apply a licensed surface spray which is applied to the perimeter of your home or building. What Can You Do To Reduce Ants? Reduce food and water sources that are available to Ants and avoid keeping rubbish indoors overnight. Get a Free Ant Control Quote Now – Phone 131 546 or BOOK ONLINE 24/7. I was lucky that Raymond did the job for me. He came in no time, explained everything in details and answered all my question. He really did an excellent job inside and outside my house. Iain was very friendly and knowledgeable, I would definitely recommend his services to others.